Home / Archive by Category "What’s Happening"
Get Stoked on Automated Wood Heat! Boiler on its last legs? Looking to opt out of fossil fuels? Come learn about today’s self-stoking automated wood heat! Opt out of oil with delivery of local wood pellets and whole home wood heating systems controlled by your thermostat. Fully automated pellet boilers take the place of your old oil or propane boiler (or furnace) for hands-off, whole-home wood heating. Heating with regionally sourced wood pellets retains wealth locally, creates jobs for our neighbors, decreases your carbon footprint, and helps keep forests as forests. On top of that you may decrease your heating bill by up to 30%. Join us on Tuesday, April 10th from 7:00-8:30pm at the Chelsea Town Hall for a presentation, learn about $7000 in available rebates, meet local installers, and enjoy light refreshments. For questions, please contact Sarah Brock, Energy Program Manager at Vital Communities, 802-291-9100 x109 orsarah@vitalcommunities.org. Weatherize Round Two kicks off this month across the Upper Valley region. Vital Communities partners community volunteer teams with local contractors to help Weatherize participants complete cost-effective home energy improvements. These upgrades save residents money on heating bills, increase comfort, and reduce the amount of energy needed to stay warm throughout the winter. New Hampshire residents living in Orford, Piermont, Lyme, Lebanon, Plainfield, and Cornish and Vermont residents living in Springfield, Chester, Woodstock, Pomfret, and Bridgewater can participate in this round of Weatherize. Visit your state’s Weatherize homepage or sign up here to stay in the loop about all the latest Weatherize events and deadlines. Each community team will be hosting a launch event later this month. See below to learn more about your community’s upcoming kick-off. Orford-Piermont-Lyme: Saturday, January 27 at the Rivendell Academy in Orford. 2 – 3:30 pm. Lebanon: Monday, January 29 at the Kilton Library. 7 – 8:30 pm. Plainfield-Cornish: Wednesday, January 24 at Plainfield Elementary School. 7 – 8:30 pm. Springfield-Chester: Thursday, January 25 at the Springfield First Congregational Church. 6 – 7:30 pm. Woodstock-Pomfret-Bridgewater: Tuesday, January 30 at Norman Williams Public Library. 6 – 7:30 pm. What happens at the kick-off events? The kick-off event is an opportunity to meet your community’s volunteer team, partner contractors, and Vital Communities in a fun and informational setting. You’ll learn about what you can expect from the Weatherize program, chat with neighbors who’ve been through the process before, and get the nitty gritty on costs, benefits, financing, and incentives– all in one place! You don’t want to miss it. Refreshments will be provided and the events are free and open to the public with no registration required. We’ll see you in January! ​Working together to empower home buyers and sellers throughout the Upper Valley to understand home energy costs and invest in energy efficiency. Over 50 real estate professionals from across the Upper Valley will gather on January 9 to kick off the new Upper Valley Green Real Estate Network, a project of Vital Communities. Participants include Realtors, lenders, home inspectors, appraisers, real estate lawyers, and home energy professionals. Vital Communities and our partners believe we can do more to promote “Green Real Estate” in the Upper Valley by working together than we can by working in isolation. Stay tuned for more from this inspiring group of local real estate leaders! Vital Communities, Upper Valley Sierra Club, and volunteers from several Upper Valley energy committees are joining forces to host the Upper Valley Electric Vehicle Expo on Saturday, September 9, from 12 to 4 p.m. (rain or shine) at the Dothan Brook School in White River Junction, Vt. as part of National Drive Electric Week. The Expo is free and open to the public. Attendees are encouraged to pre-register online at UVEVExpo.org for a chance to win $250 and other prizes. Electric vehicle owners from across the region will show off their wheels, with several local car, bicycle and motorcycle dealers bringing the latest all-electric models for visitors to explore. Vehicles will include the popular Nissan Leaf and Chevy Bolt, as well as the Tesla Models X and S, Tesla Roadster, BMW i3, Mitsubishi i-MiEV, Smart Fourtwo and others. The Dartmouth Racing Team will also bring their electric race car. Free test rides will be offered throughout the afternoon. It’s true. Most new fully electric vehicles can drive more than 100 miles, with some current models going more than 200 miles on one charge. Driving electric is cheaper, too—comparable to paying $1.50/gallon at the pump. Not to mention great acceleration and increased traction thanks to efficient electric engines and heavy batteries. 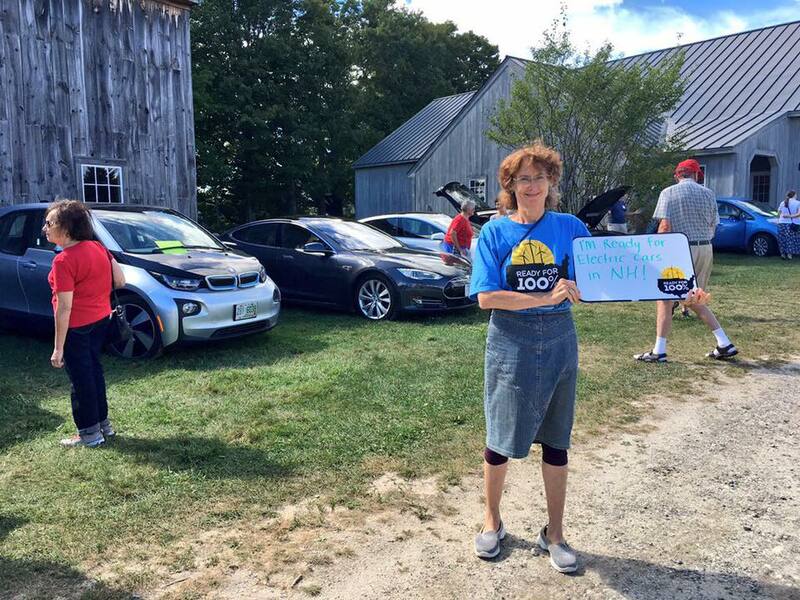 According to Drive Electric Vermont, the number of electric vehicles in Vermont has increased by 40 percent over the last year alone. That trend is expected to continue in the Upper Valley and across both Vermont and New Hampshire as vehicle ranges increase and more charging stations are installed. The September 9 Expo will feature more than just cars—electric motorcycles, bicycles and even lawn equipment will also be available for visitors to see, touch and try. Drop-in presentations from 1 p.m. to 3 p.m. will cater to both electric-vehicle enthusiasts and those who are new to the technology. Families are welcome and there will be free refreshments. Event sponsors include Catamount Solar, Cyclewise, Energy Emporium, Green Mountain Power, Lyme Green Heat, Newport Chevy, Nissan of Keene, Norwich Technologies, Omer and Bob’s, ReVision Energy, Solaflect Energy, SunCommon, Twin State Ford, Zoom Bikes, Building Energy and Anne’s Country Store. Town energy committees from central Vermont came together on November 21 in Randolph, Vermont to learn about and discuss solar power development, siting problems, and solar project types. The forum focused on how to best expand solar electrical generation in the region on a community scale. Many thanks to the Randolph Energy Committee and Vermont Technical College for hosting the event, and to the many presenters and participants whose thoughts and questions gave us all much to think about. Presenters included community solar activists, solar developers, solar technical and legal experts, local community leaders, and the Vermont Public Service Board will present information at this forum. The day’s agenda is linked below along with slides from the day’s presenters (not every presenter used slides). Calling all community energy leaders: VECAN’s 8th Annual Vermont Community Energy and Climate Action Conference is coming right up! REGISTER TODAY! This inspiring conference emphasizes clean energy and climate action strategies that Vermonters can help implement locally — and beyond. Find out far more and register. The theme of the day is: A Common Agenda: Transforming Vermont’s Energy Future. The day is aimed at supporting and growing the statewide network of town energy committees and building the capacity and expertise of any Vermonter interested in helping the state meet its ambitious but essential goal of getting 90 percent of our energy in 2050 through renewable sources. Workshops range from seizing solar in 2016 to the legislative look forward, from pioneering rural transportation solutions to measuring, assessing, and prioritizing energy action – and many more timely, informative sessions. Each workshop is aimed at building the expertise and capacity of grassroots energy leaders…and building the kind of broad, diverse public support for needed energy and climate action. The keynote is can’t miss! Richard Heinberg – a Senior Fellow at the Post Carbon Institute – will keynote the conference. Mr. Heinberg is a widely regarded author, educator and energy and peak oil expert. He has authored scores of essays and articles that have appeared in such journals as Nature, The American Prospect, Public Policy Research, Quarterly Review, The Ecologist, The Futurist, European Business Review, Yes! and The Sun; and on web sites such as Resilience.org, Alternet.org and Counterpunch.com. The conference also offers unparalleled networking opportunities, both with local energy leaders and Vermont’s leading clean energy businesses, organizations, institutions and state agency partners who generously help make this day possible. Register today. Early registration prices end November 22! Our Climate and Energy Future: Is the Proposed Lebanon/Hanover Gas Depot and Pipeline System a Bridge or a Barrier to a Clean Energy Future? To learn more or get involved, email energy.climate.uv@gmail.com or join the Facebook group Energy and Climate–Upper Valley. Note: This forum is not organized by Vital Communities. Did You Miss Our Solarize Webinar? Good news: You can see what you missed in a video on the New Hampshire Local Energy Solutions website! Solarize Upper Valley has helped residents in 24 towns go solar – over 300 residents to date, and over 450 expected by the end of the year. What’s the secret to success? Find out by watching the webinar recording. You’ll hear from Vital Communities, as well as the volunteer-installer team who brought Solarize to Randolph, Brookfield, and Braintree, Vermont, last winter. Many communities are launching Solarize campaigns across the Northeast—yours could be next! Congrats to our Volunteer of the Year! Nancy Mogielnicki was honored earlier this month as Vital Communities’ 2014 Volunteer of the Year. Nancy received her award at the annual Vital Communities Open House. This is the organization’s third annual Volunteer of the Year Award, which last year honored Lyme, N.H., resident Carola Lea and in 2012 recognized Nancy and George Smith of Hartland, Vt.
Teachers, parks and museums and other communities are using Valley Quest Questing to engage.